We all knew it was coming, but now it's finally official. Apple has released the iPhone 6 and it's pretty much the biggest change to the product that the Cupertino based company has given us since the first iPhone was released way back in 2007. But, it's not just one iPhone, oh no. There's two - the iPhone 6 and the iPhone 6 Plus. Stay tuned for a hands-on review, which will be coming shortly. To see how the iPhone 6 Plus, which boasts a 5.5-inch display, compares to Samsung's Galaxy Note 4, check out our head to head or read on to see if you should upgrade from the iPhone 5s to the iPhone 6. First we had 3.5-inches, then the iPhone 5 gave us 4-inches, but now, finally, we have an iPhone with a 4.7-inch display. As with all iPhones since the 4, Apple has attached the Retina Display moniker to the iPhone 6 meaning pixels will, hopefully, be a complete pain to spot. Speaking of the resolution, it is now 1334x750 (the iPhone 6 Plus is 1920x1080) which is a nice increase from the 1136x540 of the iPhone 5 and 5s. 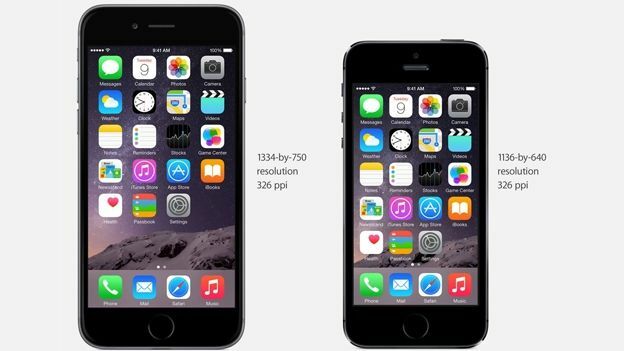 Apple says the 6 has 38% more pixels than the 5s, along with a broader angle of view. Can it match up the 1080p displays of Android superphones like the Samsung Galaxy S5 or even the 2K versions on the LG G3 and Samsung Galaxy Note 4? You'll have to wait for our full review to find that out. Increasing the screen size from 4-inches to 4.7-inches clearly means the device itself is going to be quite a bit larger, but how bigger actually is it? Well, the iPhone 5s came in at 123.8 x 58.6 x 7.6mm, with a weight of 112g, the iPhone 6 on the other hand tips the scales at just 6.9mm thick - making it one truly thin phone. Instead of the straight lines that made up the iPhone 5s, Apple has gone much more curvy with the 6, rounding off the sides and giving the phone a look that resembles the iPad Air and iPad Mini. All the side mounted buttons have been given a refresh, while the on/off switch has thankfully been moved from the top to the side. The Lightning connector and headphone jack still cover the bottom. Aluminium, as you'd probably expect is still the material of choice, though the display is now covered in strengthened glass (not sapphire though), so expect scratches to be much fewer and far between. While almost every high-end Windows 8 and Android smartphone has packed NFC for countless years now, Apple has finally decided to stick a Near Field Communications chip inside its flagship smartphone. Having NFC means the iPhone can now make use the new Apple Pay feature, which lets you add cards into the Passbook by just taking a picture of it. iOS8 obviously will come preinstalled, with its array of features like improved notifications, extensions, the Health app and more. Apple, as usual, hasn't delved deep into the specs for the new iPhone 6, though we know it runs on a dual-core A8 processor, with a 64-bit architecture, and with a suspected 1GB of RAM. Apple says the CPU is 25% faster this year, with 50% faster graphics and the device should be able to run at full power throughout the charge cycle. Apple showed off a few game demos during the presentation and we have to say the graphical detail, which is provided by the new Metal engine Apple announced at WWDC, looked pretty fantastic. Last year's iPhone 5s was the first Apple phone to pack a 64-bit processor, an A7, so the jump to A8 should give improved performance along with better battery management. You'll also have access to the brand new M8 coprocessor, which tracks motion and works in tandem with HealthKit in iOS8, great for keeping an eye on your daily step count. One of the new features of the M8 is that it can tell the diffference between cycling and running, plus there's also a barometer. The WiFi has thankfully been upgraded to 802.11ac, a feature that previously wasn't supported. 16GB, 64GB options for internal storage are available, though for the first time a 128GB choice is available for the phone. Notice no 32GB option? Keeping that 4.7-inch display toting iPhone juiced up is a battery that Apple claims will easily see you through the day, offering 10 hours of LTE browsing, the same as the 5s. One of our favourite aspects of the iPhone 5s was its 8-megapixel, sapphire covered snapper that boasted an f/2.2 aperture, backside illuminated sensor and a nifty true tone flash. It was fast, took some of the best pictures we've ever taken with a smartphone and had a flash that we didn't instantly turn off and never even think about putting it back on again. So, what improvements can we look forward with the iPhone 6? Well for one the 8-meg sensor is still here, as is the same aperture, though there is a new feature called 'focus pixels' and an improved image engine which offers advanced noise reduction and faster autofocus. Image stabilisation is also offered, though on the iPhone 6 it's only digital, but on the 6 Plus it's optical. 1080p video is supported for both 30fps and 60fps and there's an improved hyper slow-mo mode. Up top there's a new FaceTime HD camera, with better face detection and an all new sensor that lets in 81% more light, plus the ever popular 'burst selfie' mode. While we were pretty sure we were going to see a new iPhone today, it's still good to finally be able to say it's official. it seems that Apple has finally moved the iPhone forwards for possibly the first time since the iPhone 4 gave us that first Retina Display, thanks to that bigger screen and features like NFC.